Following my winter hiatus spent working on a variety of projects including a book photo editing project, I attended an exhibition by artist Sharon Harper and was captivated by her work. Harper happened to be among a group of photographers with which I shared a brief, but lively conversation last spring at Fotofest. I had the most minimal look at her photographs at the open portfolio night, before some distraction pulled me away from her table. I was pleased then, to have the opportunity to see her work at Bergamot Station in Santa Monica. 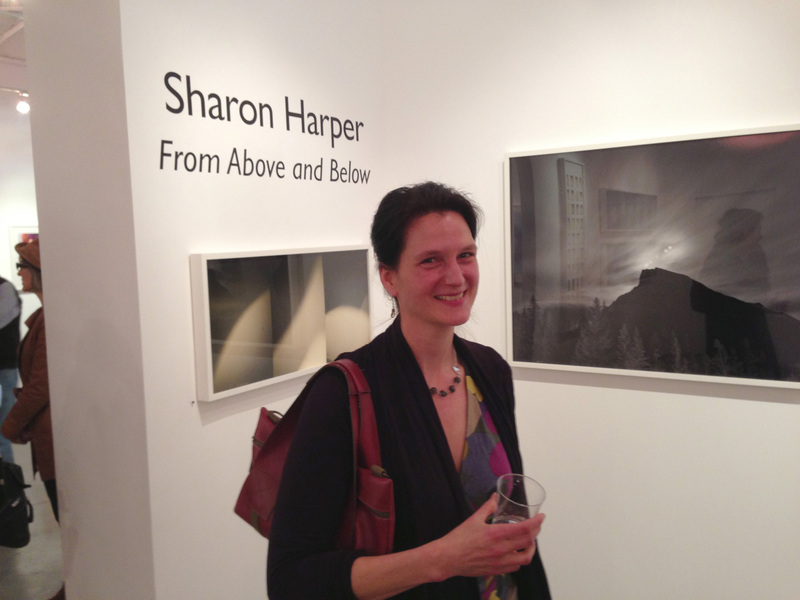 Selections from Sharon Harper’s series “From Above and Below” elevate the small interior gallery space with a handsome series of large-scale images of the sky, taken primarily through a telescope. More specifically, they were taken with a camera attached to a telescope. Harper has served on the photography faculty at Harvard for the last eight years and has work included in such prominent collections as MOMA and the Whitney in New York, Portland Art Museum and the Nelson-Atkins Museum in Kansas City. She also has a striking new book of her work “From Above and Below,” published by Radius Books in 2012. Sharon Harper’s photographs feature an ethereal, minimalist esthetic. They are at once graphically beautiful, clean and spacious and also provoking of curiosity. 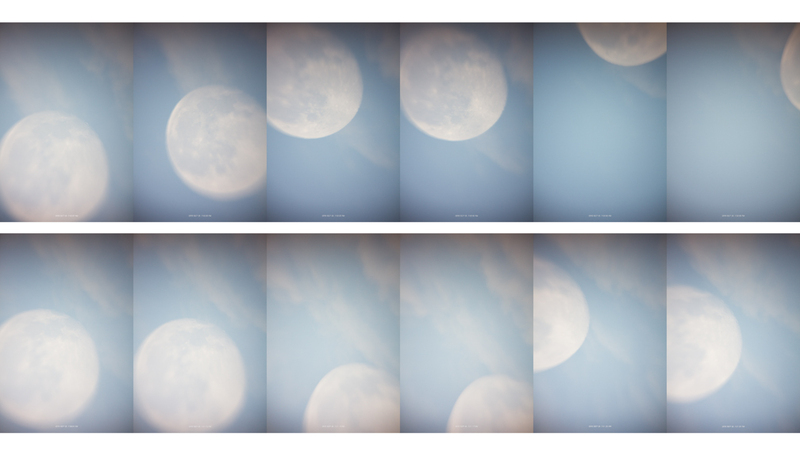 The sequences of the moon as it rises and falls through the night sky in one image and into the morning in another, feel scientific but also somehow comfortingly familiar. They are the stuff that we spent our childhoods day-dreaming about. Her telescope is clearly more powerful than the one my grandfather put on the porch above the Columbia River as we squinted to try to find the craters, cheese and the man on the moon, yet her sense of discovery is full of the same wonderment. 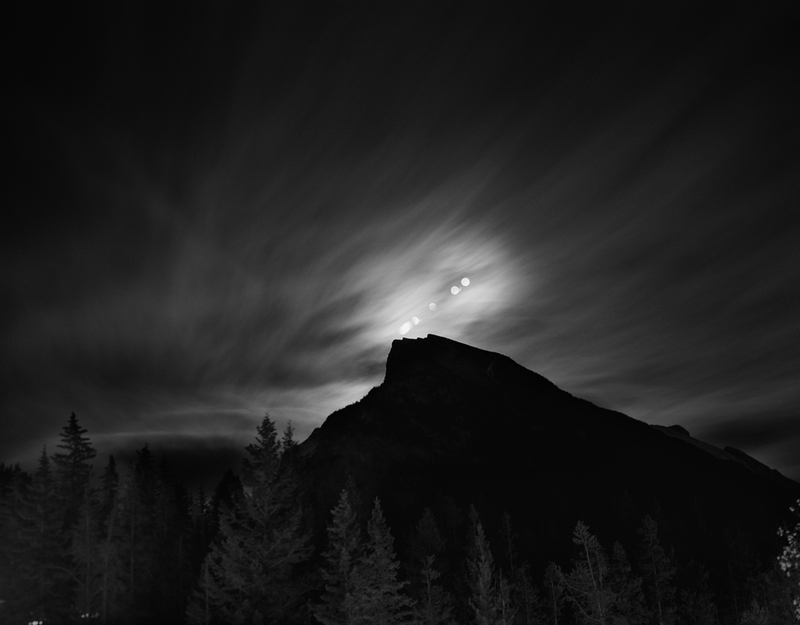 In “One Month Weather Permitting,” Harper charts the night sky over Banff, Canada. She writes that the photographs are “capturing long-exposure star trails for two or three consecutive nights on a single sheet of film throughout the period of a month. Environmental interruptions, such as passing clouds, light pollution, and light leaks, are all recorded in process.” The resulting images appear at first like drawings by the most delicate of hands. Exquisite fine lines and scratches fill the frame, reflecting the movement of both the camera and stars alike. In a sense, Sharon Harper is a classic documentarian. Her detailed notes of photographic times of shutter release mark many of the frames and her photographs not of the sky, but of the location where the sky photos were taken, give a sense of place and orient the viewer in the way a more typical documentarian might lay out their story. In the most compelling art, the longer one looks, the more one sees. Sharon Harper’s photographs allow us to escape the confines of our terrestrial visual rootedness for glimpses of something beyond our world and yet so much a part of it. The biggest disappointment about the exhibition was that Harper’s work was not featured in the larger dominant space at Bergamot Station’s DNJ Gallery. It’s not the first time a gallery has shown its strongest work in the lesser exhibition space, and to my dismay, I’ve noticed it several times at DNJ. Harper’s photographs are so esthetically strong and so conceptually interesting that it’s truly a shame that they aren’t the first thing one sees upon entering. It was well worth my time to enter, but I would have enjoyed a larger sampling. Sharon Harper with her photographs. Sharon Harper’s “From Above and Below” can be seen through April 13, 2013 at DNJ Gallery, Bergamot Station, 2525 Michigan Avenue, Suite J1, Santa Monica, California. Her work is also represented by Galerie Stefan Ropke, in Cologne, Germany and by Rick Wester Fine Art, New York.